Leading the way as a smart city, the City of Fort Collins will test new smart street sweeper technology this year as part of an innovative pilot project to ensure roads are properly maintained for residents and visitors. This program's mission is to clean city streets and bike lanes as required to provide safe conditions for all modes of transportation. 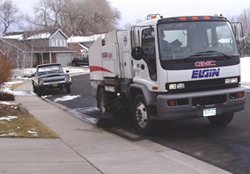 Clean streets support good air quality standards and stormwater quality services to the residents of Fort Collins. * Sweeping variances may occur due to weather. We will sweep missed streets if resources allow. Clean streets are important for storm water drainage and keeping Fort Collins looking great. Remove vehicles, trash cans, basketball hoops and other obstructions from the street. Keep tree branches and bushes trimmed back so sweepers can sweep up to the curb line. Residents, business owners and landscape companies can also help out by not blowing grass clippings or disposing yard waste, leaves and branches into the street for a sweeper to clean up. When are we sweeping your street? If you have any trouble, please give us a call at 970-221-6615 and we'll be happy to help. The staff at Streets strives to improve customer response and control expenses through sweeping scheduling and planned sweeper replacement. We welcome any feedback and reporting. You can report pothole/street hazards online or you can call 970-221-6615.